Whether fields are initially displayed expanded or collapsed. Note: The report layout determines to what level the highest dimension is expanded when the report is initially opened. A user can navigate the dimension, expanding and collapsing it at will. A report hierarchy can have multiple report layouts so that you can create different reports from the same data. The column names must be exactly as shown. The order of the columns is arbitrary. IDs for calculated values are defined here. IDs for labels are arbitrary text strings. For calculated rows, the formula for the calculation based on the IDs. The formula can include addition, subtraction, multiplication, and division (+, -, *, /). Note : Formula fields must not also appear in the report hierarchy. Note: You can add labels to a report. the order in which columns are displayed. 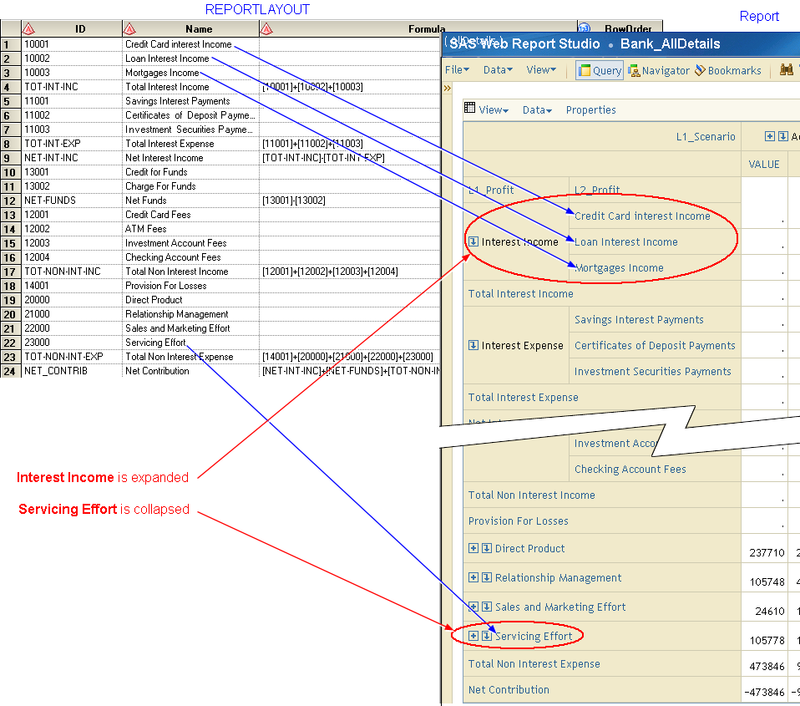 REPORTLAYOUT causes income variables display before expense variables. whether fields are initially displayed expanded or collapsed. You can see in the following graphic that the Servicing Effort field is displayed collapsed because it is included in REPORTLAYOUT without any of its children showing. 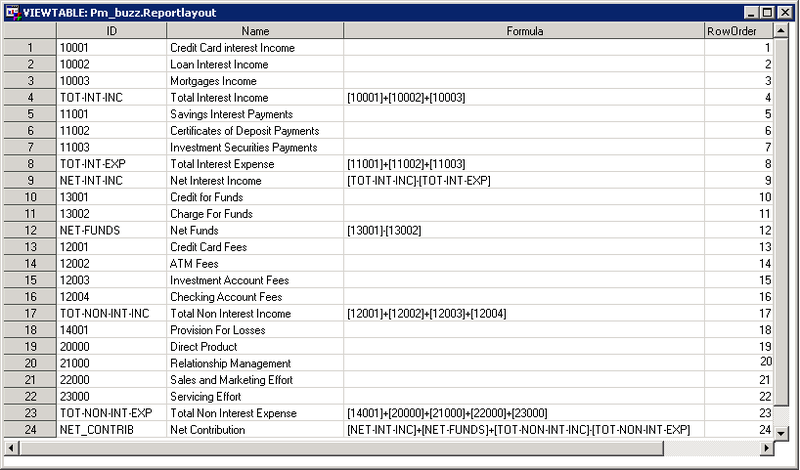 By contrast, the Interest Income field is displayed expanded to level 2 because its children (credit card interest income, loan interest income, mortgage income) are included in REPORTLAYOUT but not the parent - Interest Income. totals. For example, line 4 of the report layout displays a total whose formula is: ++ - that is line 1 + line 2 + line 3.